A single mother of five, Ellen Rogers has endured her fair share of tragedy, having lost both her first husband and stepdaughter to cancer. But nothing could have prepared Rogers for the June 2005 car accident that left her son Ned-now twenty-five years old-a quadriplegic with a brain injury. The road to Ned's recovery was long and discouraging, but when Helping Hands: Monkey Helpers for the Disabled stepped in to provide him with a service animal to help him cope with his disabilities, things turned around. 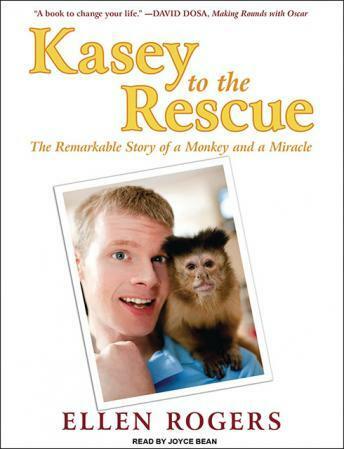 Kasey-an adorable, mischievous, fun-loving capuchin monkey-helped Ned and his family to see the world in a new way. In this extraordinary memoir, Rogers paints a vivid portrait of a large and loving family and the challenges that they face together. She shares the low points (the phone call that changed her son's life), the high points (the monkey play that led to Ned's increased mobility), and the strangely in-between (bathing Kasey in the kitchen sink) with equal parts heart and humor. The story of an ordinary family thrust into extraordinary circumstances, this inspiring book proves that old adage: where there's life, there's hope.